Inquisitive semantics is a semantic framework that is based on a formal notion of meaning, which, unlike the traditional truth-conditional notion, captures both informative and inquisitive content. The framework allows for a unified analysis of statements and questions, as well as linguistic elements that interact with both statements and questions, such as modals, quantifiers, connectives, discourse particles, and certain intonation patterns. In inquisitive semantics, an utterance is intuitively seen as a proposal to update the information commonly established in a conversation in one or more ways. Statements propose a single update. Questions propose two or more alternative updates. This makes questions inquisitive: they invite a response from the addressee that establishes at least one of the alternative updates. The way in which inquisitive semantics enriches the notion of meaning changes our perspective on logic as well. Besides the classical notion of logical entailment, the semantics also gives rise to a new notion of inquisitive entailment and a more general treatment of logical operators such as connectives (e.g. and, or, if, not), quantifiers (e.g., some, all), and modal operators (e.g., must, may, know, believe, wonder). The way in which inquisitive semantics enriches the notion of meaning also changes our perspective on pragmatics. The main objective of pragmatics is to explain aspects of interpretation that are not directly dictated by semantic content in terms of general features of rational human behaviour. 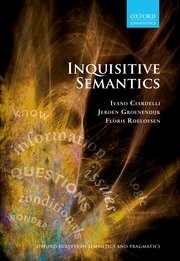 Since inquisitive semantics offers a richer notion of semantic content, pragmatics becomes richer as well. Traditional Gricean pragmatics consists exclusively of speaker-oriented rules for providing information. Inquisitive pragmatics has the same basic objective, but is more general: it is both speaker- and hearer-oriented, and specifies rules for exchanging information rather than just providing information. This makes it possible to derive a wider range of implicatures, in particular ones that arise from inquisitiveness. To learn more, listen to a recent interview on inquisitive semantics broadcasted by Elucidations, a University of Chicago Philosophy podcast. If you have any questions, or if you would like to contribute to this website, please get in touch!